Europe on edge as celebrations in Brussels, Paris canceled. 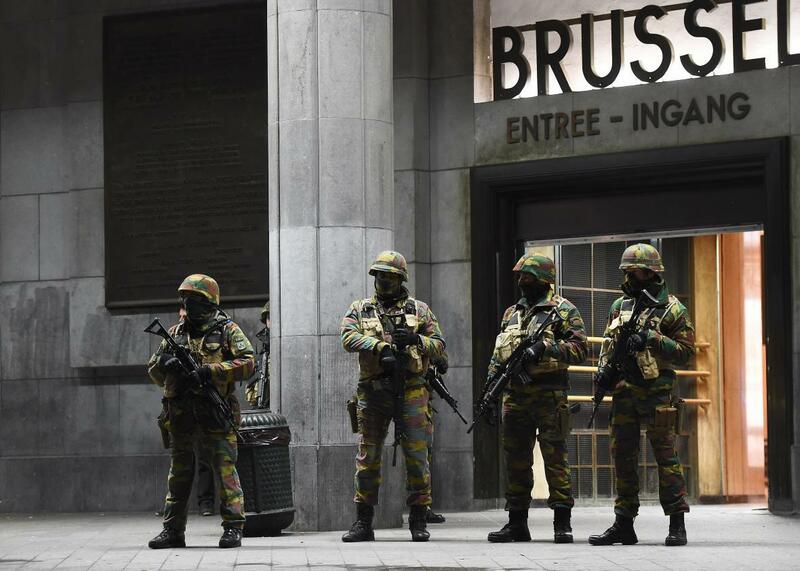 Soldiers stand guard in front of the central train station on Nov. 22, 2015, in Brussels. Citing heightened terror threats, officials in Brussels and Paris have canceled major New Year’s Eve events. Paris was the site of a terrorist attack by ISIS last month that left 130 people dead, and many of the attackers came from Belgium. The mayor of Brussels, Yvan Mayeur, said on Wednesday night that a “significant” risk of a terrorist act targeting New Year’s Eve celebrations had caused the city to cancel its official festivities and fireworks display, Bloomberg reported. Brussels also canceled its New Year’s Eve fireworks program because of a terror threat in 2007. After arresting two members of a motorcycle club called the Kamikaze Riders in connection with a New Year’s Eve plot earlier in the week, Belgian officials detained six more suspects on Thursday morning, the BBC reported. Meanwhile, Belgian police charged a 10th suspect in connection with the Paris attacks after a raid conducted on Wednesday. A Belgian citizen identified as Ayoub B. was charged with terrorist murder and participation in terrorist activities. Paris also canceled its main New Year’s fireworks display, but the normal gathering at the Champs-Élysées will go ahead as planned as will a shortened version of a typical program at the Arc de Triomphe. The tightened security extended as far as Russia, where the BBC reported authorities in Moscow were closing off the Red Square, which normally houses a public midnight countdown. And on Wednesday in Ankara, Turkey, suicide vests and bombs were reportedly found during police raids that uncovered an alleged plot to attack New Year’s celebrations in that city.